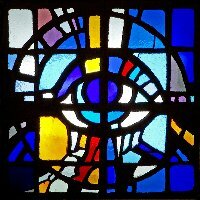 How Stained Glass is Made? For hundreds of years, stained glass has adorned the windows of churches, cathedrals and public buildings. It can also be used in artworks, especially sculpture and in lesser buildings and houses as additional features. Stained glass is glass which has been coloured via the use of additives at the molten stage. Small pieces of the glass are held in place by pieces of lead to make up a picture. The glass is also painted to add detail. The windows can be purely decorative, can tell a story (usually a Bible story) or can depict a significant person. Modern stained glass is made by machine. Often thick slabs are produced or Cathedral Glass (see below). Stained glass is considered more an art form now and is produced primarily for restoring old windows using traditional methods. Cylindrical Glass: A cylinder is firstly made by blowing the molten glass. This cylinder is cut open and flattens, forming a rectangle before it is cooled. Crown Glass: The molten glass is put on to a spinning wheel, a bit like a potter’s wheel. It then spreads out as the centrifugal force forces it to the edges. Thicker glass forms in the centre and ridges form towards the edges. Table or Cathedral Glass: This is characterised by a crinkling effect on one side of the glass. The molten glass is dropped on to a metal table – the textures are formed by a reaction between the glass and the cold metal. Flash Glass: This is normally red and is made by dipping or flashing clear glass into molten red glass to coat it. This is because the production of red glass was expensive so laminating a cheaper glass reduced costs. Different depth of colours is achieved through the thickness of the coating. It was sometimes engraved to reveal the clear glass underneath. The making of the window is achieved through a series of steps. The design needs to take account of any support bars that may be needed to keep the window together since it is very heavy. 1. Obtain a template of the window from the architect so that the size and shape of the window can be determined. 2. A Vidimus is prepared which is a drawing of the design. This is finalised with the customer. 3. A Light is prepared which is a full sized drawing of the window. This will be used as a ‘pattern’ for cutting the glass and placing the lead or copper. This is called a cartoon. 4. Each piece of glass is cut to fit the template drawn on the cartoon. 5. The glass pieces are finished by painting on any fine details. 6. The glass is slotted into lead which has been prepared into the correct shape using the templates. 7. The lead is soldered at the joints. 8. Special cement is used to seal the glass into the lead and prevent it from moving. 9. Iron rods are used to support the weight of the window and are places so they do not interfere with the picture. 10. Copper is sometimes used instead of lead in modern windows. Here is a great range of templates and supplies to help you with your stained glass projects.